Both these options result in your application being provided with an OAuth 2.0 token, which gets attached to each request made to Data Lake Storage Gen1. 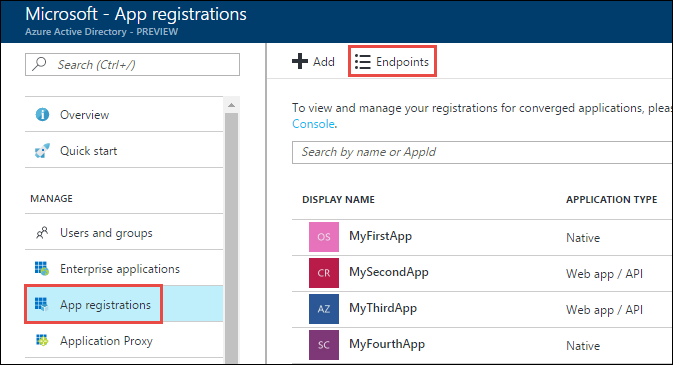 This article talks about how to create an Azure AD web application for service-to-service authentication. For instructions on Azure AD application configuration for end-user authentication, see End-user authentication with Data Lake Storage Gen1 using Azure Active Directory. Create and configure an Azure AD web application for service-to-service authentication with Azure Data Lake Storage Gen1 using Azure Active Directory. For instructions, see Create an Azure AD application. When programmatically logging in, you need the ID for your application. If the application runs under its own credentials, you also need an authentication key. For instructions on how to retrieve the application ID and authentication key (also called the client secret) for your application, see Get application ID and authentication key. For instructions on how to retrieve the tenant ID, see Get tenant ID. Sign on to the Azure portal. 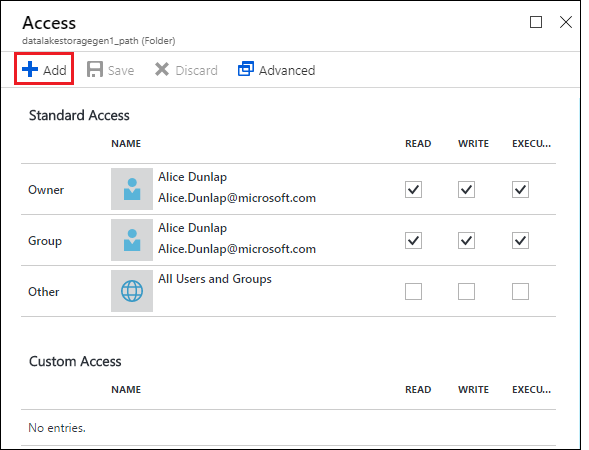 Open the Data Lake Storage Gen1 account that you want to associate with the Azure Active Directory application you created earlier. 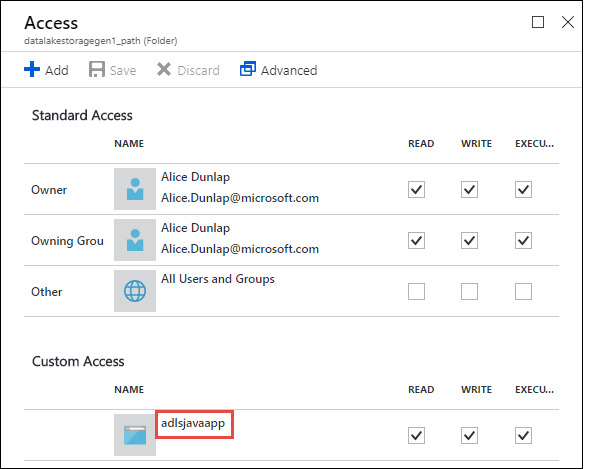 In the Data Explorer blade, click the file or folder for which you want to provide access to the Azure AD application, and then click Access. To configure access to a file, you must click Access from the File Preview blade. The Access blade lists the standard access and custom access already assigned to the root. Click the Add icon to add custom-level ACLs. Click the Add icon to open the Add Custom Access blade. In this blade, click Select User or Group, and then in Select User or Group blade, look for the Azure Active Directory application you created earlier. If you have many groups to search from, use the text box at the top to filter on the group name. Click the group you want to add and then click Select. 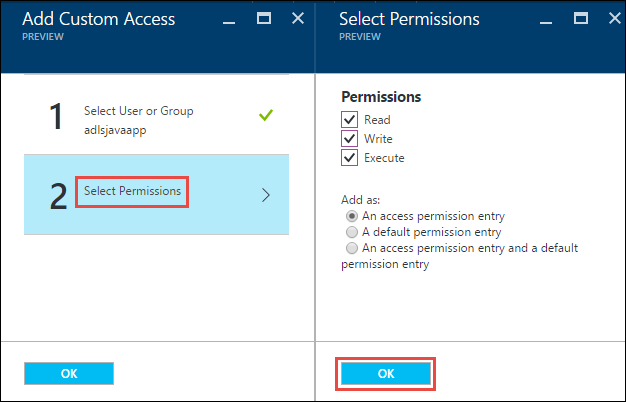 Click Select Permissions, select the permissions and whether you want to assign the permissions as a default ACL, access ACL, or both. Click OK.
For more information about permissions in Data Lake Storage Gen1, and Default/Access ACLs, see Access Control in Data Lake Storage Gen1. In the Add Custom Access blade, click OK. The newly added group, with the associated permissions, are listed in the Access blade. If you plan on restricting your Azure Active Directory application to a specific folder, you will also need to give that same Azure Active directory application Execute permission to the root to enable file creation access via the .NET SDK. 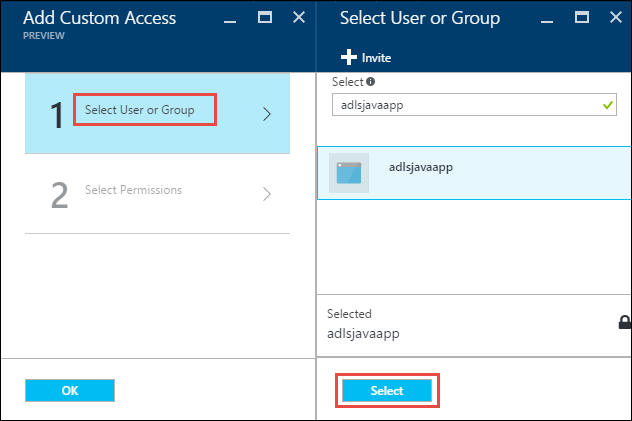 If you want to use the SDKs to create a Data Lake Storage Gen1 account, you must assign the Azure AD web application as a role to the Resource Group in which you create the Data Lake Storage Gen1 account. Sign on to the Azure portal and click Active Directory from the left pane. From the left pane, click App registrations. From the top of the App registrations blade, click Endpoints. From the list of endpoints, copy the OAuth 2.0 token endpoint. 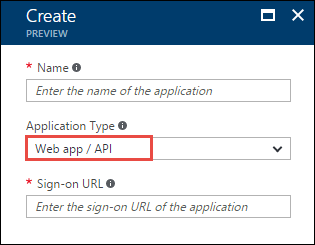 In this article, you created an Azure AD web application and gathered the information you need in your client applications that you author using .NET SDK, Java, Python, REST API, etc. You can now proceed to the following articles that talk about how to use the Azure AD native application to first authenticate with Data Lake Storage Gen1 and then perform other operations on the store.